To create a calm and cohesive space, treat the dining and living room combination as a single room. Proper planning can help you highlight the best features of the room. Judiciously choosing coordinating colors will tie the space together and leave you with a designer look. A woman reads the newspaper in her contemporary yet rustic home. Color palettes and a color wheel on a desk. Acquire a color wheel. They're available online or in a paint store. The color wheel is your guide to finding the shades that will work best in the space. To treat the space as a single room, it's particularly important to be careful about the colors you introduce. A good place to start is by looking at the color of your sofa, the largest piece of furniture in the living room. 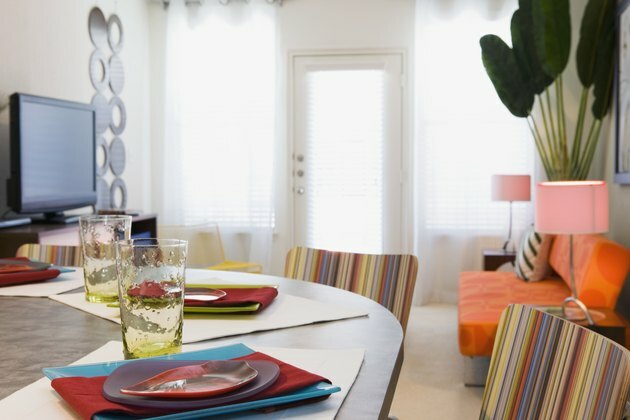 Make it the color focal point around which you make all other decorating decisions. A living room and dining room in neutral shades. Choose a paint color for the walls. Opt for a complementary shade, the hue directly across from the color of your sofa on the color wheel. For instance, if your sofa is medium teal, the color across from it on the wheel is sandy beige. Choose a analogous shade, a color directly next to teal on the wheel. In this case, it would be green or blue. Another option is to go with a monochromatic shade. Decorating in a monochromatic color scheme involves using lighter and darker shades of teal. The final option is to use a neutral shade, a color that works with nearly every color and helps make the space feel larger. Brown, tan, cream and egg-shell white are examples of neutral shades. A dining room table is set with colorful accents that match the living room. Implement the 60-30-20 rule that designers use. This rule states that for a room to achieve a balanced color palette, 60 percent of the space should be covered in a primary color. In this case, it will be your walls. Thirty percent of the room should consist of a secondary color, found in the furniture fabric, drapes and area rug. 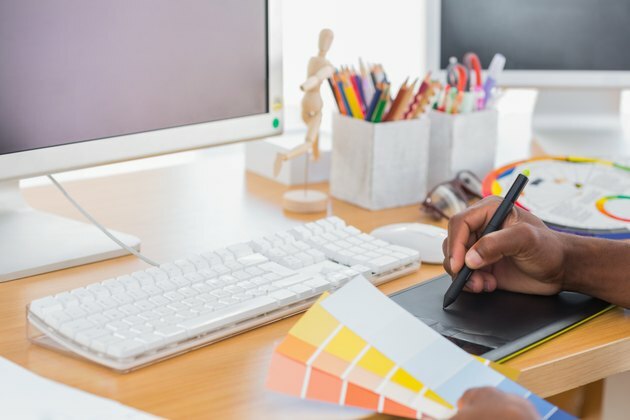 The final 10 percent should be an accent shade that you introduce through accents such as table place mats, lampshades, flower arrangements and artwork. In the case of a space with a teal sofa, the walls might be light brown. Accents in a deeper shade of brown or a blue of similar intensity to the teal sofa would work well. 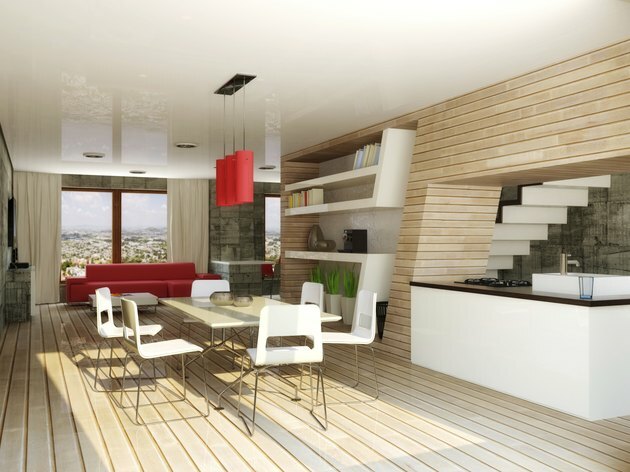 A modern living room and dining room with neutral shades and red accents. Layer in furnishings. It's easy for a dual-purposed space to look "busy." To prevent this, layer in one detail at a time and stop when you have balance. This may consist of a few pieces of art, throw pillows that match the dining room chair covers and a single candelabra. 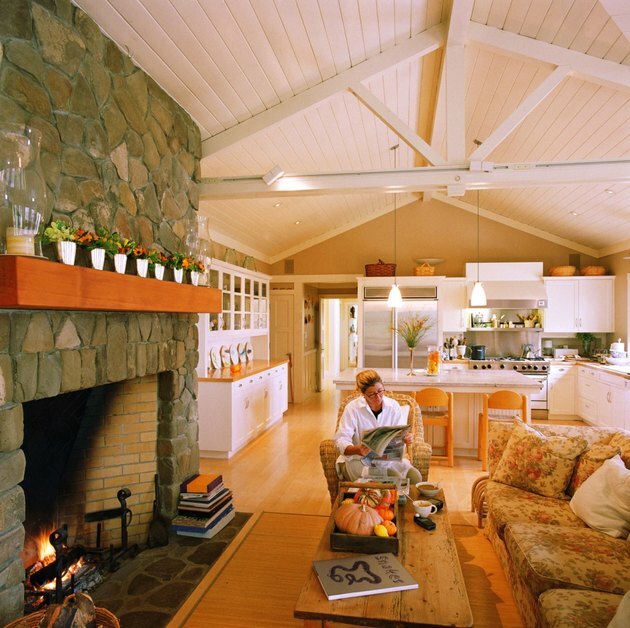 The adage "less is more" is especially true when decorating a dual-purpose space. A happy woman sits in a chair with her baby. Edit the space. Even after you've carefully layered furnishings into the room, stand back and decide whether there's anything the room can do without. If you like an item but it doesn't fit into the space, use it in another room or store it for later use.